1) Moderated the Chula Vista Genealogical Society Research Group on Wednesday, with 13 in attendance. I reviewed the RootsTech video and syllabus sites, several excellent blog posts about RootsTech presentations, and sending in my FOREVER box. Then I explained the new Ancestry ThruLines and MyHeritage Theory of Family Relativity features in some detail. Lastly, I described how I add information to FamilySearch Family Tree profiles and how I made the 7-generation fan chart. The attendees shared their progress in the last month or two. 2) While reviewing the FamilySearch Family Tree changes in the weekly email, I noted that my 4th great-grandmother Catherina Ruth's profile had been changed and a father added. I clicked on the profile, went to the father looking for information about him, and noted that there was a link to the father's will on Ancestry. I followed the link, found the will, and there was Catherine's name and listed as "wife of Jacob Konig." BINGO! I downloaded the will. Through Family Tree links, and Ancestry Hints, I have added George Ruth's parents and grandparents, plus a wealth of source material for the families. 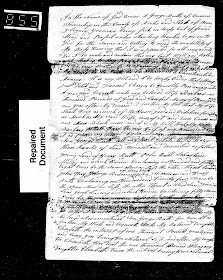 3) Found and transcribed the 1812 will of George Ruth (1740-1812) of Berks County, Pennsylvania for Amanuensis Monday. 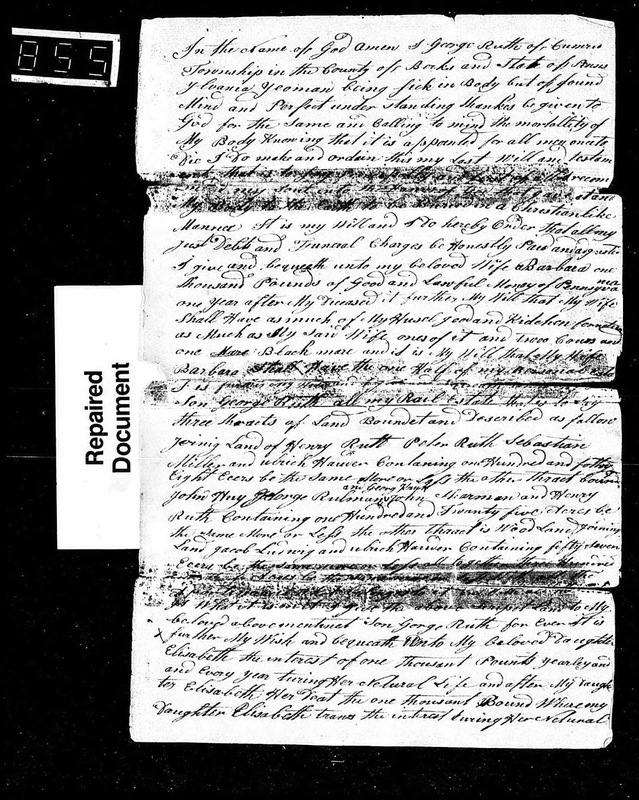 4) Wrote and posted a biography of 6th great-grandfather #442 Joseph Colby (1707-1768) of Amesbury, Massachusetts and Chester, New Hampshire for my 52 Ancestors post on Friday. 5) Watched one Family Tree Webinar - Suggested Relationship Paths: An Inside Look at the Theory of Family Relativity™, by Ran Snir. 6) Participated in today's Mondays With Myrt. Today's webinar discussed new books (Genealogy Standards, 2nd edition; Tracing Their Steps - A Memoir; Family Tree Toolkit; and the Research Like a Pro Guidebook); Google+ goes away on 2 April; the SSDI and acquiring the application from Judy's blog; the new Discord.gg message boards (Russ started an FTMUser server); the Guild of One Name Studies (GOONS); my George Ruth will find; and Reunion and RootsMagic software features. 7) Worked some more on the new Ancestry ThruLines feature for connecting with about 120 of my AncestryDNA matches. Added about 20 "DNA Match" Facts and Notes for cousins with Thru Lines in RootsMagic. 7) There were several sessions working in the RootsMagic software program to update FamilySearch Family Tree profiles for Seaver families and other ancestral families, with occasional additions to the RootsMagic profiles. I have matched 29,862 of my RootsMagic persons with FSFT. Updated and cleaned up the Family Tree profiles for six ancestors, including life sketches, sources and notes. 8) I continue to use Web Hints and Record Matches from Ancestry, MyHeritage, Findmypast and FamilySearch to add content and sources to my RootsMagic profiles. I now have 52,942 persons in my RootsMagic file, and 102,736 source citations. I TreeShared three times during the last week (about 430 profiles), and resolved about 470 Ancestry Hints. I've fallen behind on the Ancestry Record Hints with 104,562 to be resolved, but I work on them weekly. 9) Wrote 20 Genea-Musings blog posts last week, of which two were press releases. 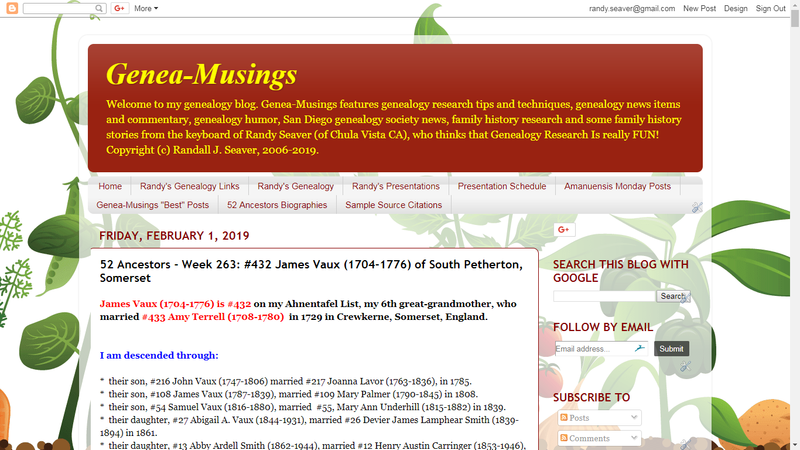 The most popular post last week was AncestryDNA ThruLines Feature Is Imperfect - An Example - UPDATED with over 1,595 views.